A/B testing (also known as split testing or bucket testing) is a method of comparing two versions of a webpage or app against each other to determine which one performs better. 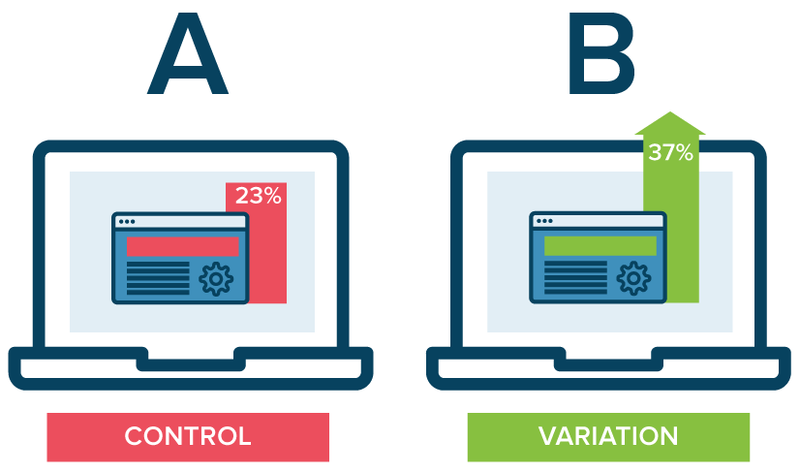 AB testing is essentially an experiment where two or more variants of a page are shown to users at random, and statistical analysis is used to determine which variation performs better for a given conversion goal. Running an AB test that directly compares a variation against a current experience lets you ask focused questions about changes to your website or app, and then collect data about the impact of that change. Testing takes the guesswork out of website optimization and enables data-informed decisions that shift business conversations from "we think" to "we know." By measuring the impact that changes have on your metrics, you can ensure that every change produces positive results. In an A/B test, you take a webpage or app screen and modify it to create a second version of the same page. This change can be as simple as a single headline or button, or be a complete redesign of the page. Then, half of your traffic is shown the original version of the page (known as the control) and half are shown the modified version of the page (the variation). As visitors are served either the control or variation, their engagement with each experience is measured and collected in an analytics dashboard and analyzed through a statistical engine. You can then determine whether changing the experience had a positive, negative, or no effect on visitor behavior. A/B testing allows individuals, teams, and companies to make careful changes to their user experiences while collecting data on the results. This allows them to construct hypotheses, and to learn better why certain elements of their experiences impact user behavior. In another way, they can be proven wrong—their opinion about the best experience for a given goal can be proven wrong through an A/B test. More than just answering a one-off question or settling a disagreement, AB testing can be used consistently to continually improve a given experience, improving a single goal like conversion rate over time. For instance, a B2B technology company may want to improve their sales lead quality and volume from campaign landing pages. In order to achieve that goal, the team would try A/B testing changes to the headline, visual imagery, form fields, call to action, and overall layout of the page. Testing one change at a time helps them pinpoint which changes had an effect on their visitors’ behavior, and which ones did not. Over time, they can combine the effect of multiple winning changes from experiments to demonstrate the measurable improvement of the new experience over the old one. This method of introducing changes to a user experience also allows the experience to be optimized for a desired outcome, and can make crucial steps in a marketing campaign more effective. By testing ad copy, marketers can learn which version attracts more clicks. 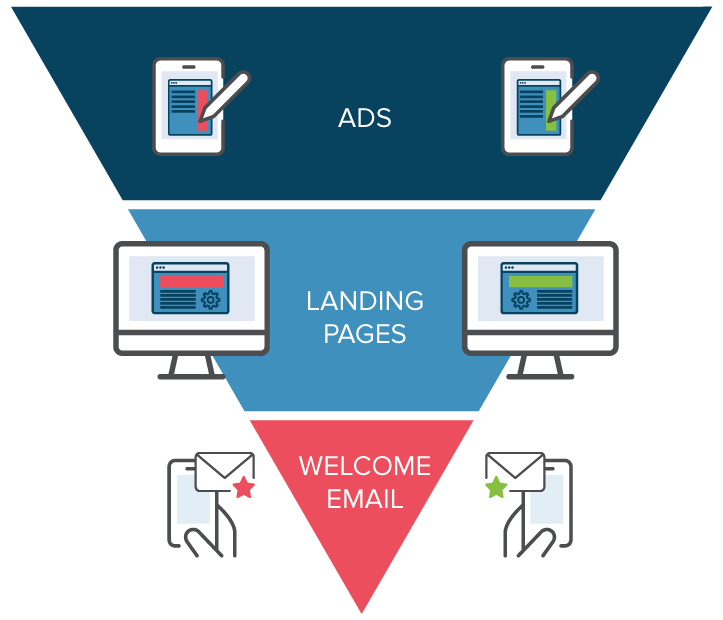 By testing the subsequent landing page, they can learn which layout converts visitors to customers best. The overall spend on a marketing campaign can actually be decreased if the elements of each step work as efficiently as possible to acquire new customers. A/B testing can also be used by product developers and designers to demonstrate the impact of new features or changes to a user experience. Product onboarding, user engagement, modals, and in-product experiences can all be optimized with A/B testing, so long as the goals are clearly defined and you have a clear hypothesis. Collect Data: Your analytics will often provide insight into where you can begin optimizing. It helps to begin with high traffic areas of your site or app, as that will allow you to gather data faster. Look for pages with low conversion rates or high drop-off rates that can be improved. Identify Goals: Your conversion goals are the metrics that you are using to determine whether or not the variation is more successful than the original version. Goals can be anything from clicking a button or link to product purchases and e-mail signups. Generate Hypothesis: Once you've identified a goal you can begin generating A/B testing ideas and hypotheses for why you think they will be better than the current version. Once you have a list of ideas, prioritize them in terms of expected impact and difficulty of implementation. 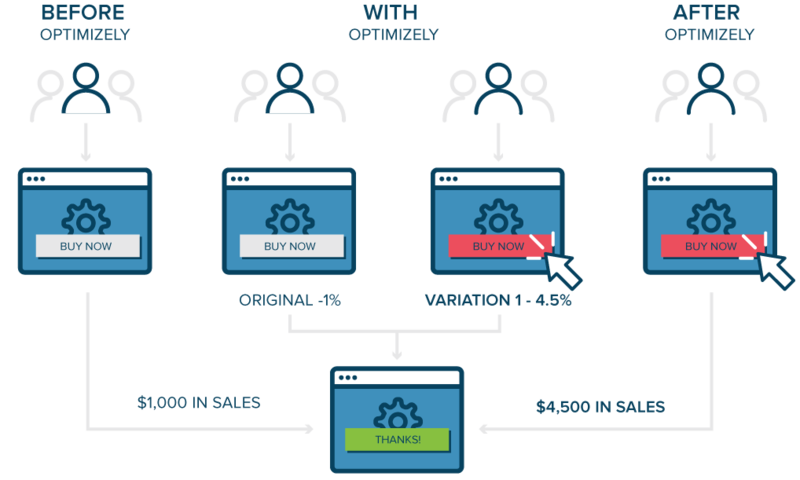 Create Variations: Using your A/B testing software (like Optimizely), make the desired changes to an element of your website or mobile app experience. This might be changing the color of a button, swapping the order of elements on the page, hiding navigation elements, or something entirely custom. Many leading A/B testing tools have a visual editor that will make these changes easy. Make sure to QA your experiment to make sure it works as expected. Run Experiment: Kick off your experiment and wait for visitors to participate! At this point, visitors to your site or app will be randomly assigned to either the control or variation of your experience. Their interaction with each experience is measured, counted, and compared to determine how each performs. Analyze Results: Once your experiment is complete, it's time to analyze the results. Your A/B testing software will present the data from the experiment and show you the difference between how the two versions of your page performed, and whether there is a statistically significant difference. If your variation is a winner, congratulations! See if you can apply learnings from the experiment on other pages of your site and continue iterating on the experiment to improve your results. If your experiment generates a negative result or no result, don't fret. Use the experiment as a learning experience and generate new hypothesis that you can test. 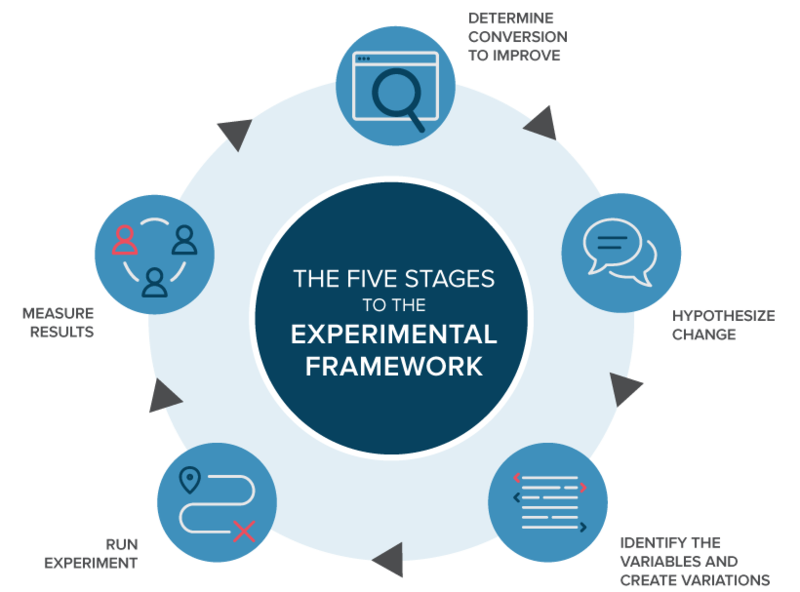 Whatever your experiment's outcome, use your experience to inform future tests and continually iterate on optimizing your app or site's experience. No Cloaking - Cloaking is the practice of showing search engines different content than a typical visitor would see. Cloaking can result in your site being demoted or even removed from the search results. To prevent cloaking, do not abuse visitor segmentation to display different content to Googlebot based on user-agent or IP address. Use rel="canonical" - If you run a split test with multiple URLs, you should use the rel="canonical" attribute to point the variations back to the original version of the page. Doing so will help prevent Googlebot from getting confused by multiple versions of the same page. Use 302 Redirects Instead Of 301s - If you run a test that redirect the original URL to a variation URL, use a 302 (temporary) redirect vs a 301 (permanent) redirect. This tells search engines such as Google that the redirect is temporary, and that they should keep the original URL indexed rather than the test URL. Run Experiments Only As Long As Necessary - Running tests for longer than necessary, especially if you are serving one variation of your page to a large percentage of users, can be seen as an attempt to deceive search engines. Google recommends updating your site and removing all test variations your site as soon as a test concludes and avoid running tests unnecessarily long. 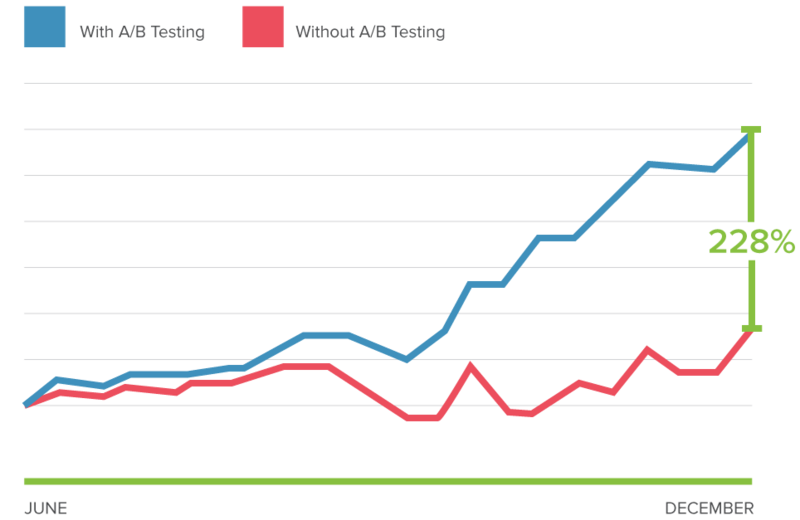 For more information on AB testing and SEO, see our Knowledge Base article on how A/B testing impacts SEO. Discovery A/B tested the components of their video player to engage with their TV show 'super fan.' The result? A 6% increase in video engagement. ComScore A/B tested logos and testimonials to increase social proof on a product landing page and increased leads generated by 69%. Secret Escapes tested variations of their mobile signup pages, doubling conversion rates and increasing lifetime value.